This vanilla bean buttercream frosting is a classic American buttercream, using all butter and no shortening. 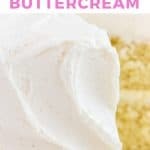 Yes there is a secret to making the best vanilla buttercream and you’re about to find out what that is! I LOVE buttercream. I’m sure you had no idea, right? I mean, look at the name of my blog! 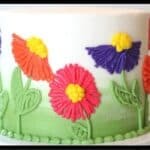 I will admit I use a lot of fondant in my cake decorating, it’s an awesome medium to work with, but I almost always use a thick layer of buttercream for the filling. 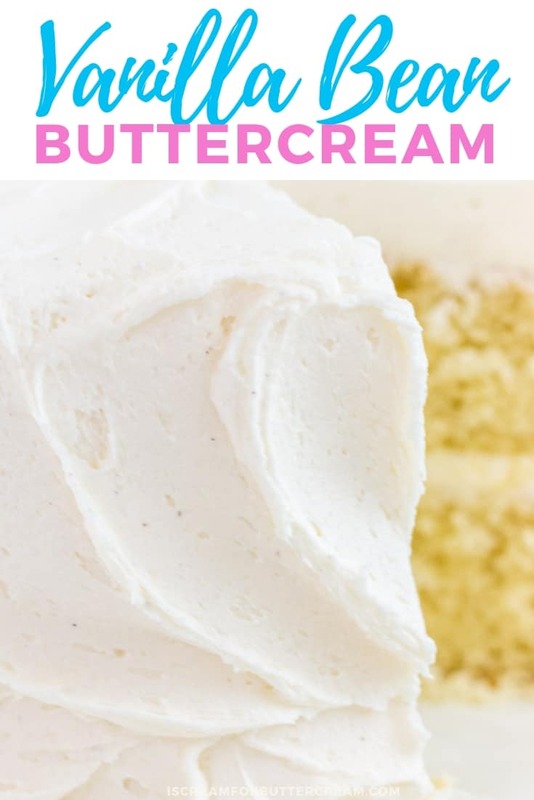 I will confess that I can eat buttercream straight out of the bowl and this vanilla bean buttercream recipe is my absolute favorite frosting. For me, the sweet creaminess of real butter American buttercream just gets me and this is my ‘go to’ recipe. But, if you’re looking for an all butter buttercream, you’re in the right place. The secret to this buttercream is that half of the butter is unsalted and the other half is salted. I also use vanilla bean paste. Yes, it definitely makes a difference. I prefer to use vanilla bean emulsion paste or Madagascar vanilla extract if you can’t get the paste. Since this buttercream uses real butter, it will have a slight yellow tint to it. 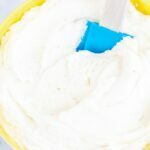 If you prefer a bright white buttercream, you may want to replace half the amount of butter with shortening and use clear vanilla extract, or check out my recipe for bright white buttercream. There are a couple ways to make all butter buttercream whiter though. You can beat it for five minutes or so, after you’ve mixed it up. When you beat it for a longer time, the color seems to lighten. You can also add in a touch of violet gel food coloring. I mean just a touch though. Violet is on the opposite side of the color wheel as yellow, so it will cancel out the yellow color, but be very careful to only use a teeny tiny amount and use a toothpick to do that. Make sure that your butter is room temperature before you start. Don’t microwave it though, that could mess with the texture of your buttercream. Just set your butter out on the counter and let it come to room temp on its own. I don’t have a stand mixer…can I just use a hand mixer? Of course! A hand mixer is completely fine to use. I don’t have vanilla emulsion or paste, what can I use instead? You can always just use regular vanilla extract in place of the emulsion or paste. Just use the same amount. Is there a way to make this icing whiter? Yes! There are a couple things you could try. I’ve laid them all out in the post above, so make sure to scroll back up and check that out. Do I have to use salted butter? No, you don’t, but I find that using half salted and half unsalted butter, makes a really tasty buttercream. If you don’t have access to salted butter, you can just use all unsalted and then add in a pinch of salt. 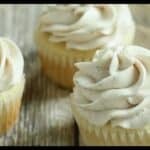 Ok, enough talk…Here’s my Vanilla Bean Buttercream Recipe. I hope you love it so much, you eat it straight from the bowl like I do…no judgement here! 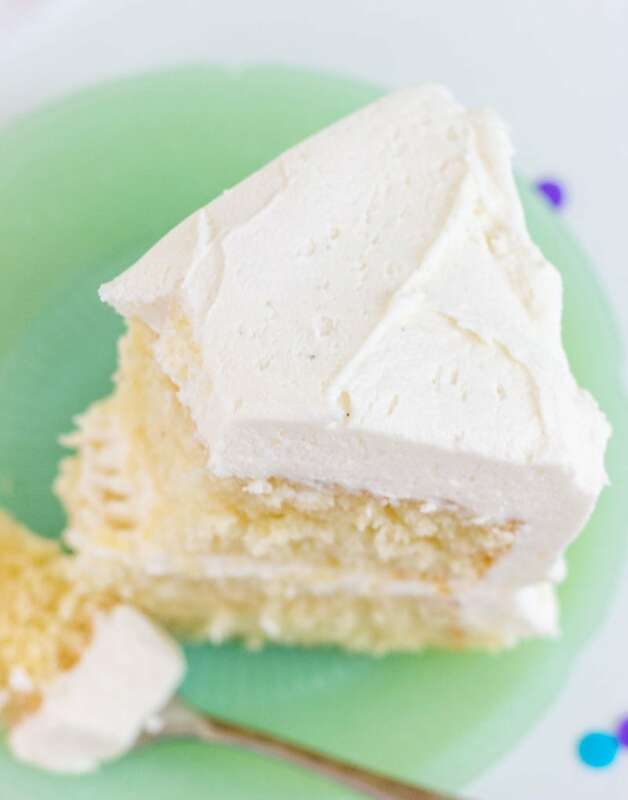 Try this buttercream recipe with my Favorite Vanilla Bean Cake recipe. 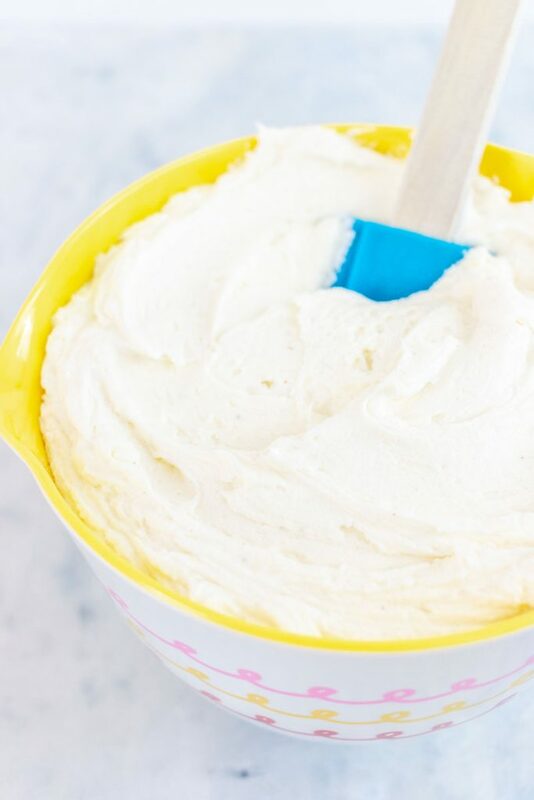 This vanilla bean buttercream frosting is a classic American buttercream, using all butter and no shortening. Add in three cups of confectioner’s sugar and beat on low until incorporated and then medium until well mixed. Add one tablespoon of milk and beat until incorporated, then add the last three cups of confectioner’s sugar and beat on low, then on medium until well mixed. Add another tablespoon of milk and the vanilla paste or extract, then beat on medium until well mixed. Now, check the consistency. If it’s too thick, add another tablespoon of milk. If it's too thin, add another cup of confectioner's sugar. Once you reach the consistency desired, beat on medium speed for about four to five minutes. The icing will lighten a bit in color. This buttercream makes enough to cover a two layer, 8" round cake or about 24 cupcakes. 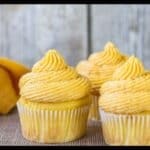 Since this buttercream is made with all butter and no shortening, it will have a slight yellow or cream tone to it. If you want it to be very white in color, you can add a very tiny speck of blue or violet food coloring to cancel out the yellow, or just add white gel food coloring. 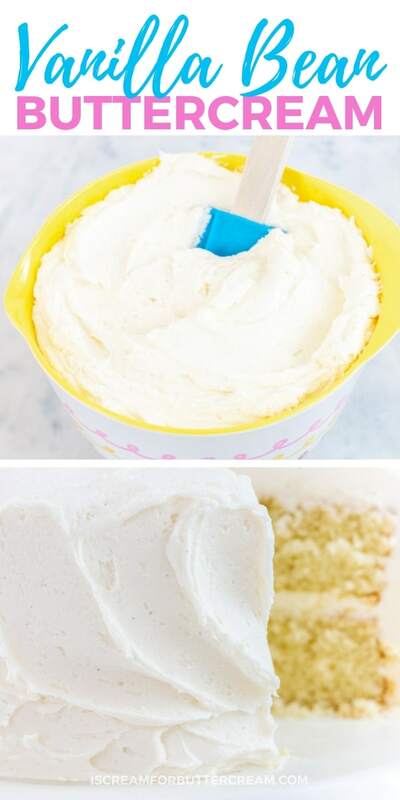 You could also whip your icing for several more minutes once it's mixed. Whipping it seems to lighten the color a bit. 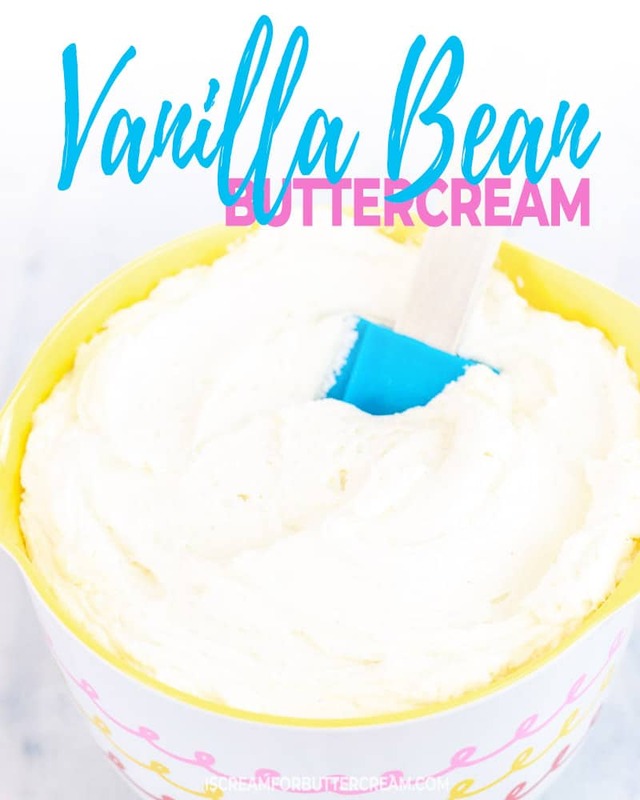 You could also add clear vanilla extract instead of regular vanilla extract and that will lighten the color although the vanilla taste will not be as good. Now you’re ready to ice your cakes, cupcakes, or even just eat it with a spoon straight out of the bowl! I don’t have a paddle attachment. Does it affect how it turns out if I use the whisk attachments? Hi Christina, It will be fine to use a whisk attachment. The paddle attachment just lessons the amount of air bubbles in the final product. 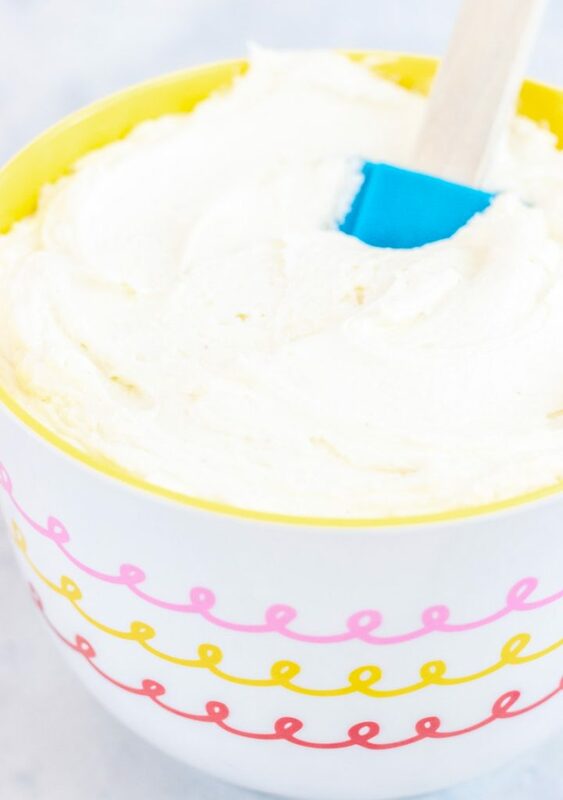 If you use a whisk attachment, after you’ve mixed up your buttercream you may just need to mix it with a rubber spatula a little if there are any air bubbles in it. I have been making and selling cakes out of my home for three years now the entire time been searching for the perfect recipe is for all my flavors to maintain my reputation for not just beautiful but delicious cake. I just want you to know your vanilla bean cake is the best I’ve ever had and I’ve decided it’s definitely a keeper for my portfolio. I have even begun swapping out the vanilla for different emulsions and/or the milk for fruit purée and the search is over! This will be may base recipe thanks so much for sharing!! Thank you so much! That’s wonderful to hear! I have to say that cake is my favorite and I’m so glad you love it. Your comment has just made my day! ? Does this recipe stack well? If I had a 3 tiered cake can it hold its own weight? I use this buttercream or a flavor variation in almost all my cakes. I’ve used it for stacked cakes many times as well. As long as you make sure and not make the buttercream too thin, and make sure to dowel between the cake tiers, it will be fine. Wow! I must say thank you so much for all here ! 1st time to comment on any blogger or page.? Based on your reply above on tiers. To stack (usual with fondate )the butter cream in between makes the fondate soggy and ‘unkept’. Though lightly applied (better cream in between) placed in the fridge after spreading on the cake and so on. What’s the best to do please? You can do one of two things: You can substitute half of the butter with shortening, or you could substitute all of the butter for shortening. You get a better taste if you do half butter and half shortening. If you go that route, just use the unsalted butter with the shortening and add a pinch of salt when you mix it up. If it’s going to be really hot and you’re really concerned about it, you might go with all shortening. Just substitute it cup for cup when the recipe calls for butter. So if you’re making the recipe as it’s printed, instead of using two cups of butter, just use two cups of shortening and add a pinch of salt. It’s not going to taste as good as all butter, but sometimes ya just gotta do it if it’s super hot outside. If you can get your hands on some high ratio shortening from a restaurant supply store…do that. It’s much creamier and works better than store bought. Also, I’d wait as long as possible to set the cake out. Even when using straight shortening, it can still only take so much sun and heat. Hope this helps. Yeah i hear u thats ok but wat im concerned about ur recipe that u hav added half salted n half unsalted butter thats the key…..so if im using 1 cup shortening thats the sustitute of one cup butter…would that butter i omit be the salted one or unsalted one?or would b half salted n half unsalted? Like as u said that i can add a pinch of salt that i already do in my buttercreams but wat if i want to add salted butter one cup n 1 cup shortening…..would that b fine? Ok, gotcha. I usually just use the unsalted butter if I’m going to add shortening. Salted butter has a little bit more water content in it and I just feel like the unsalted butter will mix better with the shortening. I want the buttercream to be as creamy as possible. It may not make THAT huge a difference, but usually I just go for the unsalted butter. My question is regarding your vanilla buttercream . Can you please tell me if this is a crusting buttercream, and how long can you store it on the counter, fridge ,and freezer ? Hi Miranda, I really wouldn’t consider this one a crusting buttercream, mainly because it’s made with all butter and no shortening. If you want to substitute shortening for half the butter, or even use all shortening, then it would be a crusting buttercream. You can store this on the counter at room temp for several days. You can also store in the fridge for a week or so. Honestly I’ve eaten it after it’s been in the fridge about a week and a half and it was fine, but I say a week just to be safe. As far as freezing it goes: Use a piece of saran wrap and place a mound of the buttercream on it, then roll up the saran wrap around it. 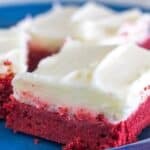 You may need to do this several times if you’ve got alot of buttercream to freeze. Pop the saran wrapped buttercream ‘packets’ in a freezer bag and then into the freezer. It should be good for a couple months in the freezer. Hope this helps! Can this recipe be used for piping rosettes? Which way works best? All butter, all shortening, or half and half? 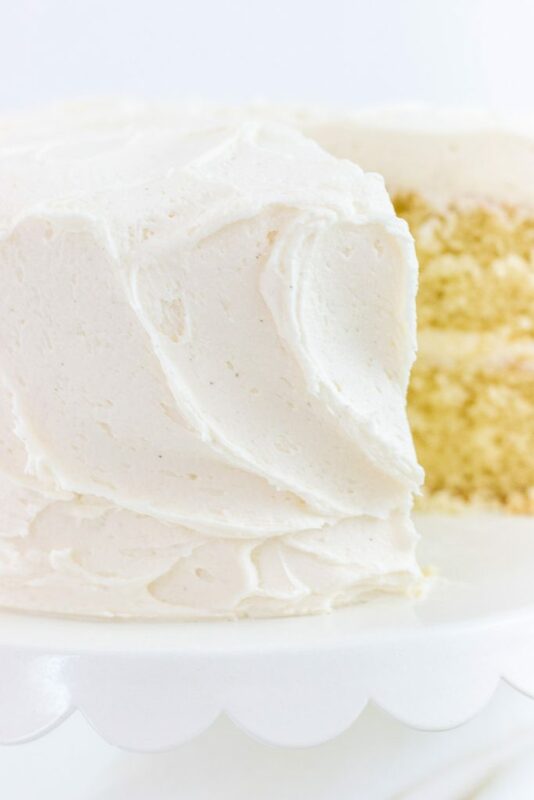 I can’t wait to make the vanilla bean cake and the frosting for a birthday and a wedding! Thank you so much Kara. I’m making my first cake next weekend for a birthday celebration. I’ll let you know how the cake and rosettes turn out. Yes I’d love to know how it all works out! 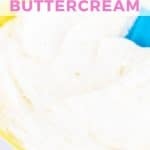 Do you ever add almond extract or emulsion to this buttercream; I usually add a little to my vanilla buttercream recipes. Oh yes…and it’s really good. I usually only add in about a 1/4 teaspoon though. I like just a slight hint of it, but you could always add more if you prefer a stronger taste. Can you use only unsalted butter and add a pinch of salt to replaced for the salted butter for the Vanilla Bean Buttercream? If yes, what would be the amount of salt? Yes you sure can. For some reason, the taste of the salted butter just tastes better to me, but if you can’t find it or don’t have the salted butter, it’ll still taste good. Just add in a pinch to about a 1/4 tsp of salt and do a taste test. If you need more, just add in another small pinch, but I think that should be enough. Hello! Thanks so much for your response and time! I bought the butter from Costco and didn’t want to get an additional package of the salted one if it was not totally necessarily. Now I can’t wait to bake the cake and taste it! Hi Kara. I’m making a black cake and want to use this recipe. Will it be ok to just add a few tablespoons of black gel and cocoa powder to this recipe or is it better to use a chocolate buttercream recipe?